This volume provides the important concepts necessary for a physician to participate in a reengineering process, develop decision-making skills based on probability and logic rather than "rules," and to measure and analyze meaningful outcomes of care delivery. This approach has been developed over ten years in a medical student-based program and has been enthusiastically embraced by medical students without backgrounds in engineering or statistics. More specifically, this text will introduce physicians to relevant and available computer software, combined with an in depth knowledge of measurement, variation, and uncertainty. It provides a basis for the transformation of data into information, information into knowledge, and knowledge into wisdom. The first quarter of the book will address understanding and visualizing data, using statistical and graphic analysis. The next quarter addresses the fundamentals of applied statistics, and the application of conditional probability to clinical decision making. The next quarter addresses the four "cornerstones" of modern analytics: regression, classification, association analysis, and clustering. The final section addresses the identification of outliers and their importance in understanding, the assessment of cause and effect and the limitations associated with retrospective data analysis. This toolbox will prepare the interested physician to actively engage in the identification of problem areas, the design of process-based solutions, and the continuous assessment of outcomes of clinical practice. Armed with this toolbox, the reader will be "prepared to make a difference" in the rapidly changing world of healthcare delivery. 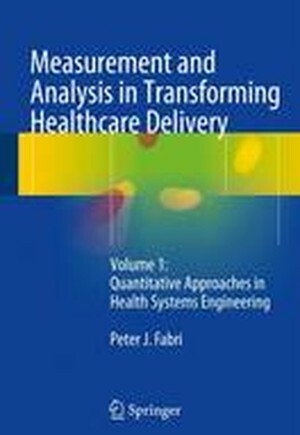 Measurement and Analysis in Transforming Healthcare Delivery is an excellent resource for general practitioners, health administrators, and all medical professionals interacting with healthcare delivery.